The most recent decade has seen rapid advances in connectivity, mobility, analytics, scalability, and data, spawning what has been called the fourth industrial revolution, or Industry 4.0. This fourth industrial revolution has digitalized operations and resulted in transformations in manufacturing efficiency, supply chain performance, product innovation, and in some cases enabled entirely new business models. This transformation should be top of mind for quality leaders, as quality improvement and monitoring are among the top use cases for Industry 4.0. 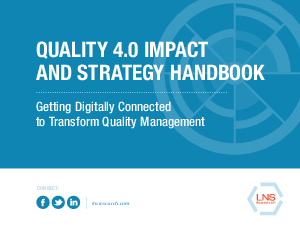 Quality 4.0 is closely aligning quality management with Industry 4.0 to enable enterprise efficiencies, performance, innovation and business models. However, much of the market isn’t focusing on Quality 4.0, since many quality teams are still trying to solve yesterday’s problems: inefficiency caused by fragmented systems, manual metrics calculations, quality teams independently performing quality work with minimal cross-functional ownership, and ineffective supplier communication, among others.